We hold a Night with the Actors for each play in our season. 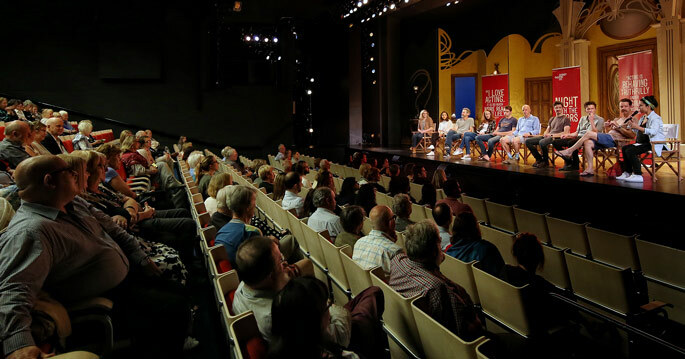 Designed to give you further insight into our plays, the audience stay in their seats after the performance and the cast return to the stage to take part in a casual Q and A session. Audience members are welcome to quiz the cast about their experience of making and working on the show. We usually hold two Night with the Actors per production. Tickets to the performances that include Night with the Actors are an audience favourite and always sell fast. The Night with the Actors event occurs post-show. Photo: A Flea in Her Ear Night with the Actors, 2016.